Cake Doughnuts are fun to make and it never ceases to amaze me how good they taste straight from the deep fryer. This is when their golden brown crust is nice and crisp, yet inside the doughnut is wonderfully soft, almost cake-like in texture (hence the name). And if that weren't enough, unlike a lot of things that are deep fried, these Cake Doughnuts store really well. Sometimes I think they are even better after a day, when their crust softens and their flavor really develops. While I often eat them plain (especially when freshly made), they are very good with a dusting of powdered or cinnamon sugar. And they become extra special when dipped in a chocolate glaze. Of course, colored sprinkles, chocolate jimmies (sprinkles), and/or shredded or flaked coconut are optional. This is what you call an Old Fashioned Cake Doughnut. I really like the subtle flavor of nutmeg in these doughnuts, so don't be tempted to leave it out. Now, Cake Doughnuts get their rise, not from yeast, but from baking powder which makes them pretty quick and easy to make. The batter is similar to a sponge cake batter, and once made, cover and let sit at room temperature until firm enough to roll (about 30 minutes). While you can buy an actual doughnut cutter to cut out the doughnuts, I just use two round shaped cookie cutters (one large and one small for the inner hole). Once the doughnuts are cut out let them rest while the oil is heating up. This allows time for the doughnuts to get a bit of an outside crust, which helps to prevent them from soaking up the hot oil when placed in the deep fryer. To deep-fry the doughnuts you will need a heavy bottomed saucepan (Dutch Oven) or deep fryer. Use a flavorless oil like corn, canola, or a vegetable oil. Heat the oil, over medium-high heat, to 375 degrees F (190 degrees C) (this could take about 20-30 minutes). It's important to maintain that temperature as at this temperature the oil seals the outside of the doughnut so it doesn't soak in. You see, if the oil is too hot the doughnut will get too brown and crisp on the outside before the inside has time to be cooked through. Conversely, if the oil is not hot enough, the doughnut will absorb too much of the oil and the texture will be soggy and greasy. So clip a candy thermometer to the inside of your pan so you can constantly monitor the temperature of the oil, adjusting the heat as necessary. (If you don't have a candy thermometer, test to see if the oil is ready by placing a small cube of bread into the hot oil. If it browns in about 30-45 seconds, the oil is at the correct temperature.) Of course, always be very careful when deep frying. Have a bowl of ice water nearby in case you burn yourself. Also have a fire extinguisher on hand and never leave the hot oil unattended. Once you make your doughnuts you don't have to throw away the oil. It can be strained and re-used for deep frying other foods, like fish or french fries. 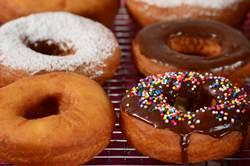 Cake Doughnuts: In a separate bowl, whisk together the flour, baking powder, salt, and freshly ground nutmeg. In the bowl of your electric mixer, fitted with the paddle attachment (or with a hand mixer), beat the eggs and sugar until thick and a pale yellow (about five minutes). Beat in the vanilla extract. With the mixer on low speed, alternately add the flour mixture (in three additions), with the milk and melted butter (in two additions), beginning and ending with the flour. (The batter will be quite soft.) Cover with plastic wrap and let sit at room temperature about 30 minutes (or until batter is firm enough to roll). Then place the dough on a floured surface, and with a lightly floured rolling pin, roll the dough to a thickness of about 1/4 inch (.5 cm). Cut the dough into 3 inch (7 cm) rounds, using a lightly floured doughnut cutter or cookie cutter (will need a smaller cookie cutter to cut out the center "hole"). Place the doughnuts on a lightly floured baking sheet, lined with parchment or wax paper. Gather up the scraps, roll, and cut out remaining doughnuts. If you like, you can keep the donut holes to fry separately. Let the doughnuts sit at room temperature while you heat the oil. Clip a candy thermometer to the inside of a large, deep, heavy bottomed saucepan (Dutch oven), and at medium-high heat, bring about 2 inches (5 cm) of oil (canola, vegetable, peanut, or corn) to 375 degrees F (190 degrees C). Carefully place the doughnuts into the hot oil, about 2 to 3 at a time depending on the size of your saucepan (do not over crowd). Fry each side until golden brown, about 60 seconds per side. The doughnut holes will only take about 30 seconds per side. Carefully remove the doughnuts from the hot fat with the end of a wooden spoon, tongs, slotted spoon, bamboo chopstick, or Chinese skimmer. Place on a baking sheet lined with clean paper towels. Let the oil return to 375 degrees F (190 degrees C) before adding more doughnuts. After the doughnuts have cooled about a minutes or two, you can roll them in granulated white sugar. Or let cool completely and then dust with powdered sugar or dip in the chocolate glaze. Chocolate Glaze: Place the chocolate in a heatproof bowl. In a small saucepan (or in the microwave) heat the cream and butter just until boiling. Pour the hot cream mixture over the chocolate and stir gently until the chocolate has melted. Stir in the vanilla extract. Then whisk in the confectioners sugar. Strain if needed. Makes about 12 to 14 - 3 inch (7 cm) doughnuts.